This podcast we had a ton of people in to talk about Fourth of July picnic protocols…like drinking wine out of plastic cups and a heavy debate about the tradition of the strawberry jello pretzel salad! 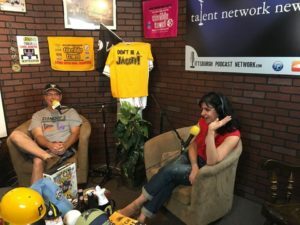 But we first learn some Pittsburgh news from Kim Lyons on Jaggin’ the News! If you don’t see the player bar below, click HERE to listen while you work or whatever! 00:55 Don’t forget to enter into our Summer Porch Tour Contest Presented by the Port Authority. Craig’s son Jack is a champion little-leaguer and Craig’s an uncle again. 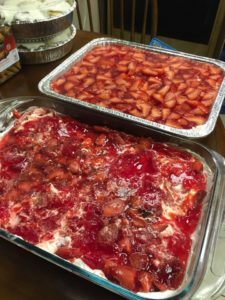 But we’re getting ready to discuss the July 4th Picnic protocols of the Strawberry Jello Pretzel Salad! 04:40 John Knight planning to show grill tips IN the studio? 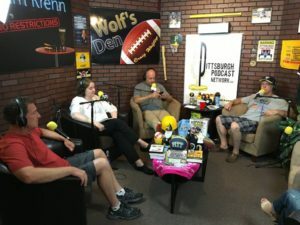 04:56 Kim Lyons with Jaggin’ the News, a quick way to get caught up on pertinent Pittsburgh news. 13:12 John Knight grilling tip on getting the charcoals started. 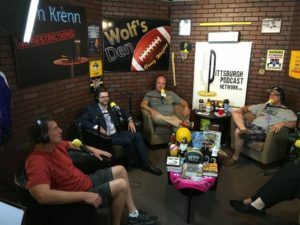 13:54 John Cornwall, sommelier for the Capital Grille, Downtown Pittsburgh, with picnic wine-drinking tips including NOT drinking out of plastic cups, wine pairings for the summer picnics and his evaluation of the in-studio tasting of the jello pretzel salad. He suggests champagne for the jello salad!! 23:10 John Knight has the grill lit and…. 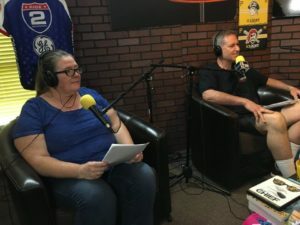 24:12 The Great Strawberry Jello Pretzel Salad Debate with Chef Tom Totin (CookSpeak Podcast) who is anti-jello, Mary MacAnallen (Mary Mac’s Bakehouse and Standing Chimney) who is pro-jello and Pittsburgh’s favorite scene reporter and PG advice columnist, Natalie Bencivenga. Tom and Mary make their cases and then Natalie gives advice on what to do if a jello salad shows up at your picnic! 41:51 The Food Tasters has announced who won the Capital Grille wine dinner for 4 complements of Chef D.
Make sure that you follow The Food Tasters for tips on where to eat what all around Western Pennsylvania. 44:50 John Knight causes a fire… who knew THAT would happen? Previous articleWhat’s New Since “Stanley” Was Here Last?